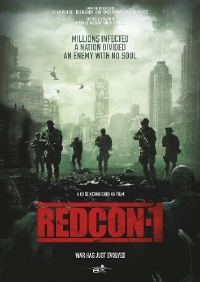 From rising director Chee Keong Cheung comes Redcon-1, a post-apocalyptic, horror action/thriller punctuated by relentless fight action and bristling with real military hardware. The film comes from the mind of writer/director Chee Keong Cheung and is produced by Carlos Gallardo (Desperado, Once Upon a Time in Mexico), Stephen L’Heureux (Sin City: A Dame to Kill For), and Kevin Eastman, co-creator of "Teenage Mutant Ninja Turtles" and publisher of "Heavy Metal". The film will see release from Dread Central Presents and Epic Pictures in MAY. Oh boy! Kung fu zombies! Just as we cannot have period pieces without featuring British accents in the lead, zombie flicks cannot have British accents. There it is. Discuss.